State Vocational Rehabilitation (VR) agencies provide a wide range of services to help people with disabilities train for, find and keep jobs that fit their skills and interests. VR agencies can also connect businesses with skilled workers with disabilities in their area. For more information, contact your state VR agency or the Council of State Administrators of Vocational Rehabilitation’s National Employment Team (The NET). Disability:IN is a national nonprofit organization that helps businesses meet and exceed their goals through disability inclusion in the workplace, supply chain and marketplace. Find a Disability:IN Business Leadership Network affiliate near you. Connect with a Business Services Representative at your local American Job Center. You’ll get help with recruiting, hiring or training employees, including people with disabilities who are ready and willing to work. Get involved with a Registered Apprenticeship program. State Apprenticeship Agencies help connect jobseekers looking to learn new skills with employers and sponsors looking for qualified workers. Apprenticeships help develop a workforce that has industry-driven training and give employers a competitive edge. They can also help increase workforce inclusion. Watch the #ApprenticeshipWorks video to learn more about these benefits. Commit to hiring a veteran by registering with the Veterans Employment Center. This resource connects veterans and their families with meaningful employment and career development opportunities. Also check out these resources on recruiting, hiring and retaining veterans. Contact your local Center for Independent Living (CIL). These organizations promote independent living and equal access for people of all ages with all types of disabilities. They often work with local employers interested in hiring qualified workers with disabilities. A growing number of CILs are becoming Employment Networks which offer many pre-employment services for jobseekers as well. Connect with your state’s Governor’s Committee on Employment of People with Disabilities. These state offices work to increase employment opportunities for people with disabilities and to promote public awareness of the needs and abilities of people with disabilities. Post your job openings on online job boards that are often used by people with disabilities. The Employer Assistance and Resource Network on Disability Inclusion (EARN) offers a list of online job posting boards that can help you find qualified workers with disabilities. Get in touch with a local college or university’s Office of Disability Student Services. They may be able to connect you to students with disabilities pursuing various fields of study who are interested in internships or employment opportunities with a business like yours. Reach out to your local Workforce Development Board. Whether you need labor market information, help finding trained workers or information about labor laws, your state or local board can connect you to what you need to strengthen your business and your workforce, including skilled employees with disabilities. Learn more about how the public workforce development system can help you find skilled workers, including those with disabilities. The Social Security Administration’s Ticket to Work (TTW) program can connect employers with organizations, called Employment Networks, that help businesses find qualified job applicants with disabilities. Call the TTW helpline at 1-866-968-7842 (voice) or 1-866-833-2967 (TTY) for more information. Social media is an effective way to reach jobseekers with disabilities. Consider posting job openings on Facebook or joining LinkedIn groups such as “Disability Student Services Professionals,” “Diversity and Disability@Work” and “Professionals with Disabilities” to engage with jobseekers with disabilities. 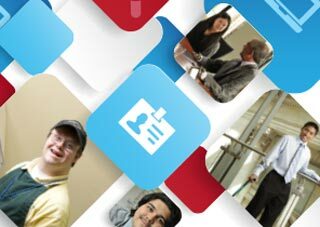 EARN has resources to help employers hire, retain and advance workers with disabilities. Get information on finding job candidates with disabilities, tax incentives and creating an inclusive work environment. The Workforce Recruitment Program helps federal agencies and businesses find highly motivated college students and recent graduates with disabilities for summer jobs or permanent employment. Fill out the Candidate Request Form to get help finding job candidates. You can also post job openings. The Schedule A Hiring Authority helps federal agencies hire people with targeted disabilities. Get answers to frequently asked questions about hiring federal workers with disabilities. For more information contact your agency’s Selective Placement Program Coordinator. The Disability and Veterans Community Resources Directory was created to help federal contractors looking to hire employees with disabilities and veterans. The directory lists governmental and nonprofit organizations that assist federal contractors and other businesses in finding qualified job applicants. There are several tax incentives available for businesses that have employees with disabilities, including federal tax credits such as the Disabled Access Credit and the Work Opportunity Tax Credit (WOTC) for companies that hire people with disabilities and qualified veterans. Business that make efforts to remove architectural and transportation barriers for people with disabilities and the elderly may qualify to take the federal Architectural/Transportation Tax Deduction. There are also state tax credits for employers who hire people with disabilities, some based on the WOTC and others related to accessibility improvements. Learn more by reading EARN’s tax incentives fact sheet. It’s important to remember that what matters is an employee’s abilities, not his or her disabilities. Job accommodations help employees with disabilities perform certain tasks that are essential for them to do their job. Under the Americans with Disabilities Act (ADA), an accommodation is considered to be any modification or adjustment to a job or work environment that enables a qualified person with a disability to apply for or perform a job. Most workplace accommodations do not cost very much, but provide a lot of benefits. According to the Job Accommodation Network (JAN), half of all job accommodations cost employers nothing. Of those that do have a cost, the typical one-time expenditure is $500 — an expense that most employers say pays for itself many times over through reduced insurance and training costs and increased productivity. Job accommodations can include things like screen reading software for employees who have low vision, raised desks for employees who use wheelchairs or job coaching for employees with intellectual disabilities. Accommodations can also include workplace Personal Assistance Services, working from home (telecommuting) and adjustments to work schedules. JAN provides free, expert and confidential guidance to employers about workplace accommodations and disability employment issues, including employment laws and regulations. Find information on reasonable accommodations for employees with disabilities and the ADA. Explore A to Z listings by disability, topic and limitation to discover effective accommodation ideas and resources. JAN has information on accommodations for employees with all types of disabilities, including mental health disabilities and other invisible disabilities. Resources are also available in Spanish. For more information, call 1-800-526-7234 (voice) or TTY: 1-877-781-9403. Read the U.S. Department of Labor guide “Reasonable Accommodation for Employees and Job Applicants with Disabilities” to learn more. Read “Inclusion@Work: A Framework for Building a Disability-Inclusive Organization” to learn strategies for making your business more inclusive of employees with disabilities. Employees with disabilities can help companies meet their business goals and diversify their workforce. The U.S. Department of Labor/Office of Disability Employment Policy’s “Building an Inclusive Workplace” guide provides additional information. The U.S. Chamber of Commerce’s “Dispelling the Myths: How People with Disabilities Can Meet Employer Needs” and “Leading Practices on Disability Inclusion” offer additional information, including case studies of companies that have successfully developed programs to hire employees with disabilities. Make sure your workplace technology is accessible for all employees and jobseekers by using tools developed by the Department of Labor-funded Partnership on Employment & Accessible Technology (PEAT). The guide, “Accessible Technology Action Steps: A Guide for Employers,” is a good resource to learn how to start the process of reviewing your workplace technology for accessibility. Use TechCheck to assess your workplace technology accessibility practices and find tools to improve them. The TalentWorks tool helps ensure that online job applications, pre-employment tests, resume upload programs and other recruitment tools are accessible.